I'm importing a set of users into my website using the Feeds module. The users have various details including company name. I wanted to make the company name field on the website a dropdown list rather than a free text field. I was thinking to make the company field a taxonomy vocabulary, and then add a taxonomy term reference field to the user profile. If I did this how would I import the company data for the user profiles using feeds? For example if Mark Twain works at Penguin how do I import correctly his company into his record? Would it be possible to create a new field in my CSV file for the company term ID and then import this into the term reference field in the user profile? I'm using D7 with the custom user fields and not the old D6 user profile module. Import the same way you would if it was a textfield. The taxonomy terms will be created for you and reused for terms with the same name. 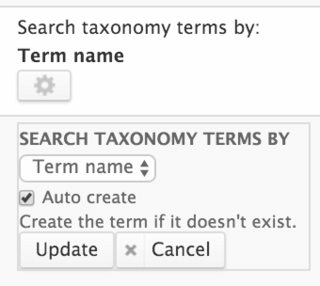 Feeds module supports importing taxonomy terms, so you're free to use it as a select list. To create a new values, all you need to do is to set Auto create option in your Node processor mapping settings next to your field. Not the answer you're looking for? Browse other questions tagged 7 taxonomy-terms feeds importing-exporting or ask your own question. Importing Feeds into an entity? How to import CSV feed into nodes with multiple taxonomy terms? Can I import “id” into “uid” by using Feeds module? How do import and save term lineage using feeds and Hierarchical select?